A beautifully presented executive detached 5 bedroom house! Built by Badger Building (EA) Ltd and with a balance of NHBC remaining, this is an opportunity not to be missed! 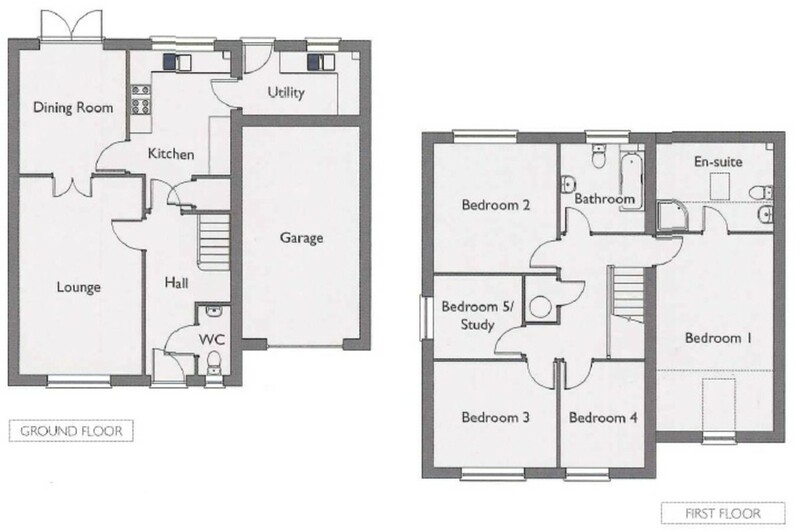 Separate lounge and dining room, kitchen with utility room, downstairs cloakroom, ensuite to master bedroom plus a modern family bathroom. View to appreciate this ready to move into home! ENTRANCE HALL Coved and smooth plastered ceiling, 2 ceiling lights, carpeted stairs to first floor with storage space under, radiator, telephone point, security alarm keypad, central heating control, wood effect flooring. CLOAKROOM Coved and smooth plastered ceiling, ceiling light, UPVC double glazed window to side aspect, radiator, pedestal hand wash basin, low level WC, vinyl flooring. UTILITY ROOM Matching base units and worktop, stainless steel single bowl single drainer sink unit with mixer tap, tiled splash backs, space and plumbing for washing machine, space for tumble dryer, wall mounted boiler, coved and smooth plastered ceiling, radiator, security alarm pad, ceiling light, UPVC double glazed window to rear aspect, UPVC door leading out to rear garden, continued tile effect flooring. GALLERIED LANDING Coved and smooth plastered ceiling, 2 ceiling lights, loft access, radiator, airing cupboard housing tank and shelving, doors leading off to all bedrooms and family bathroom, central heating control, carpet. ENSUITE Coved and smooth plastered ceiling with restricted heat height, ceiling light, inset ceiling light with extractor, Velux window to rear aspect, fully tiled corner shower cubicle with wall mounted shower, a range of built in storage units with work surfaces and tiled splash backs, inset wash basin, WC with concealed cistern, heated towel rail, shaver point, tile effect flooring. BEDROOM TWO 11' 11" x 11' 4" (3.63m x 3.45m) Coved and smooth plastered ceiling, ceiling light, UPVC double glazed window to rear aspect, radiator, television point, carpet. BEDROOM THREE 11' 4" x 9' 9" (3.45m x 2.97m) Coved and smooth plastered ceiling, ceiling light, UPVC double glazed window to front aspect, radiator, television point, carpet. BEDROOM FOUR 9' 9" x 7' 9" (2.97m x 2.36m) Coved and smooth plastered ceiling, ceiling light, UPVC double glazed window to front aspect, radiator, television point, carpet. BEDROOM FIVE 8' 2" x 7' 6" (2.49m x 2.29m) Coved and smooth plastered ceiling, ceiling light, UPVC double glazed window to side aspect, radiator, television point, carpet. BATHROOM Coved and smooth plastered ceiling, ceiling light, UPVC double glazed window to rear aspect, panelled bath with full tiling and shower over and shower screen, a range of storage units with work surfaces, inset wash basin, WC with concealed cistern, extractor, heated towel rail, shaver point, tiled splash backs, tiled effect flooring. OUTSIDE To The Front - Open plan with lawned area and path to entrance door. Driveway to side of the property. Integral garage with up and over door, power and light. Gate to side leading to rear garden. To The Rear - Enclosed by fencing with gate to side. Mainly laid to lawn with patio area. External light and tap.